Keep junior warm and cozy in this classic full zip insulated hooded jacket for cooler temperatures. 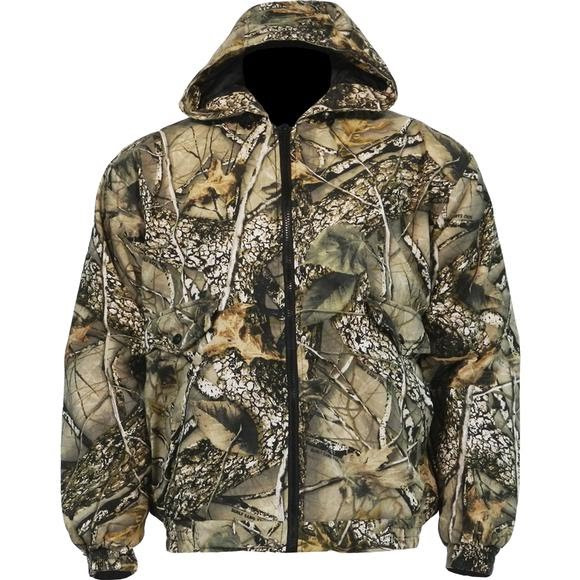 Handwarmer pockets and ribbed cuffs and hem help keep the warmth in and Burly camouflage is just like mom and dad's! Keep junior warm and cozy in this classic full zip insulated hooded jacket for cooler temperatures. Handwarmer pockets and ribbed cuffs and hem help keep the warmth in and Burly camouflage is just like mom and dad&apos;s! The reference standard for lightweight warmth and breathability. These synthetic fabrics have been the primary insulation layer of choice among experienced outdoor enthusiasts for nearly three decades for their ability to dry quickly and provide insulation value even when wet. My daughter loves her jacket!!!! She used it on her first hunting trip with her grandfather. She stated she was warm the entire time. It was a good buy.